The world famous Car festival of Lord Jagannath is held on Ashadhasukla Dwitiya i.e. the 2nd day of the bright fort-night of Ashadha (June July) every year. 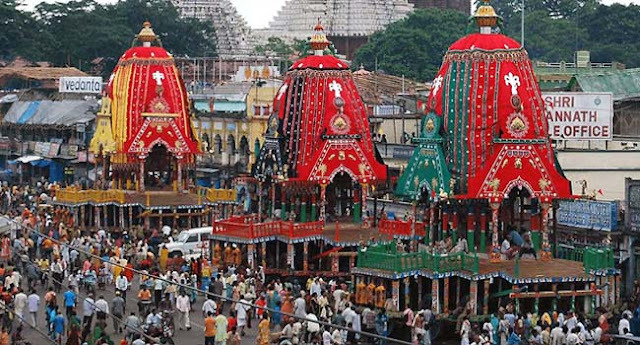 This festival is popularly known as Ratha Yatra, Gundicha Yatra and also Ghosha Yatra. On the Car Festival day, the deities are taken out of the temple and placed in their respective charots, kepts near the Singhadwar. The deities are carried to the Chariots in a traditional ceremonial manner-first Sudarshana, followed by Balabhadra, Sudhadra and Jagannath. Balabhadra and Jagannath are made to swing forward backward in a manner called ‘Pahandi’. The chariot of Lord Jagannath is known as Nadighosha. It has 16( sixteen)wheels and the colour of the fabrics that cover the roof of the chariot are red and yellow. The chariot of Lord Balabhadra is known as Taladhwaja. It has 14 (fourteen) wheels and the colours of the fabrics are red and green. Subhadra’s chariot “Devadalana’ has 12(twelve) wheels and fabrics are red and black. Sudarshan is seated by the side of Subhadra in here chariot. Mahanmohan, a representative deity of Jagannath sits in the chariot of Lord Jagannath. So also tow other small idols – Rama and Krishna take their seats in the chariot of Balabhadra, These small idols are made of metal. Thus actually seven deities namely Jagannath, Balabhadra, Subhadra, Sudarshana, Madanmohan, Rama and Krishna are seated on three chariots and moved to a temple known as “Gundicha Ghar” which is at a distance of about 3kms from Jagannath Temple. The chariot of Balabhadra is dragged first, followed by those of Subhadra and Jagannath. One the first day if any chariot cannot reach the Gundicha Ghar, it is dragged on the next day. On the ninth day i.e. the Return Car Festival day, the deities are brought to the Singhadwar area of the Jagannath Temple. An important ritual performaed, on the 5th day (starting from and including the day of Car festival) is known as ‘Hera Panchami’, when goddess Laxmi proceeds to Gundicha Ghar to see Lord Jagannath. In the evening of the 10th day (i.e. the 11th day of the bright fortnight of Asadha) the deities are adorned with gold ornaments and dressed gorgeously in their respective chatiots parked in the Simhadwar area. On the same day another ritual called ‘Hari Sayan Ekadasi’ is performed. On the following day i.e. the 12th day of the bright fortnight, important ceremoney known as ‘Adharapana Bhog’ is performed. A sweet drink is offered to the deities. On the evening of the following day, the deities are taken to the temple in a traditional procession amidst gathering of thousands of devotees. A nice written up on the world famous Rath Yatra. The sacred festival is observed almost everywhere on the country and even on the world. People coming from distant places often find problem of finding a good budget hotel for spending some wonderful days in this holy city. But unfortunately not all get the right kind of hotel rooms they want. So it's recommended that you should book your tickets online to make your stay confirmed and comfortable.